We are happy to provide something a little different for this years U21 players championships. The event will be run using a modified version of the Curling Skins format. If you haven’t played Skins Curling before, here is how it works. Each end of the game is assigned a dollar value, early ends have a lower value with the amount at stake increasing as the game progresses. Your team wins the skin by scoring 2 or more points (with hammer), or stealing 1 or more points (without hammer). The skin is not won in an end that results in a score of 1 or a blank, instead, the value of any unclaimed skins are carried forward and added to the value of the next skin. The normal rules of curling (5-Rock Rule) are in effect for all ends. There is no extra end, if the final skin is not won, then it is decided by a draw to the button thrown by any player on the team, with sweeping. The opposition team may not sweep during the draw to the button. 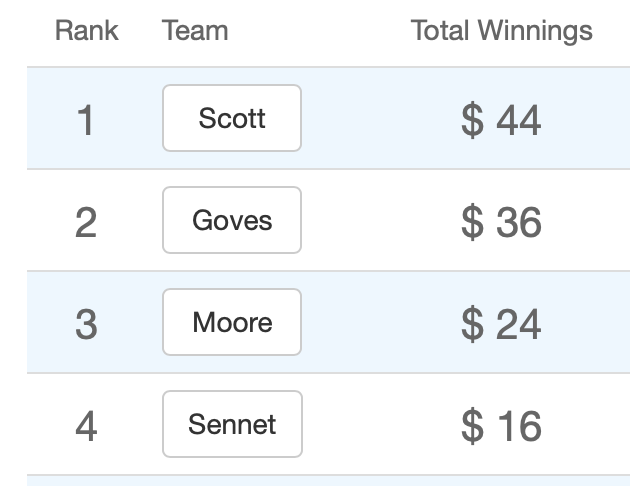 Your ranking in the standings is based on your total winnings through the round robin games. The top four teams will qualify for the finals, with the top 2 playing in the main event final, and the next two playing in a consolation final. As always, a shootout after your first game will be used as a tie-breaker for determining the teams that qualify for the finals. As always, fans can follow along on LiveScores which has been updated to include support for our Skins games. Instead of end numbers, the value of each skin is shown, in addition LiveScores will show how much is “at stake” including any carry overs. The Junior Slam Series has modified the skins rules slightly. Each team will get the same number of hammers. If your team wins the draw to the button, then you can choose to have hammer in either the odd numbered ends, or the even ones. Each team will be earning prize money for each skin they win. The values of skins will increase as the weekend goes on, with playoff games being worth more than round robin games, and the most valuable skins coming in the finals.